What is the opportunity cost of your human capital? CEO’s know that up to 70% of their costs are spent on their people, but how much do they invest in optimising the productivity and effectiveness? Here’s how you can ensure that your organisation finds the right people, who are focused on doing the right things, the right way – all the time. 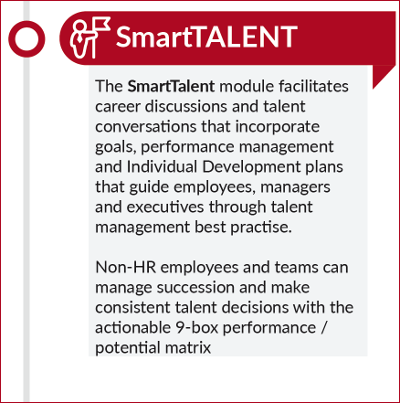 Using SmartTalent, you can improving productivity by up to 5%, which would improve your profitability dramatically. Starting with position management, SmartHR models the people structure your company needs to achieve your business strategy. Pre-populated job libraries make it is easy even for non-HR specialists, to define the skills and competencies that are required. Based on the profile of your current high performers, quickly identify similar thinking styles to ensure a best fit. SmartRecruitment screens, track applicants and manages your candidate pipeline whether for internal or external recruits. Successful candidates are on-boarded effortlessly to ensure that the induction experience is quick and professional. SmartPerform allows your company to identify high performers through ongoing goal evaluations and periodic performance reviews. Individual and group performance schemes can be scored and rated in line with company models or use the balanced scorecard approach. The SmartHR browser-based platform simplifies the submission, completion, tracking and analysis of performance reviews, so that they can be done more regularly. Detailed performance dashboards and analytics help you to spot potential talent and under performers that can drive your retention and reward decisions. Development plans and activities can be based on performance to rectify poor performance or accelerate future leaders to support your succession and growth plans. 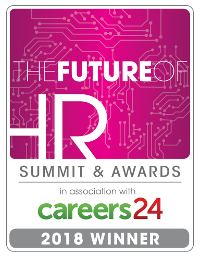 Employees can identify future roles that they would be suited for and using the SmartHR eLearning capability, develop the required skills at their own pace.